Governor Deval Patrick today held a private signing ceremony to enact a law that removes the possibility of parole for certain repeat criminal offenders, handing the pen he used to advocate Les Gosule but upsetting at least one other prominent supporter who was not invited. The 1999 murder of Gosule’s 27-year-old daughter, Melissa, provided the impetus for the so-called “three-strikes” legislation. Her killer was found to have a record of 27 previous convictions, for which he had served a total of less than two years. It gained added momentum after the murder nearly two years ago of Woburn Police Officer John “Jack” Maguire by another repeat offender. 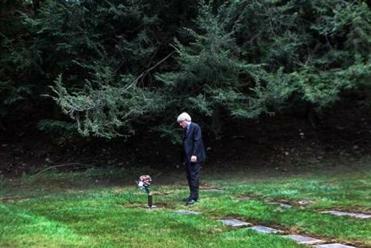 Les Gosule visited his daughter Melissa's grave at Sharon Memorial Park after the Governor signed the "three-strikes" billon Thursday. Gosule immediately headed to the Sharon Memorial Park, the cemetery where his daughter is buried, to mark the occasion at her grave. “After a 13-year struggle to achieve this new public safety law, I want to first dedicate this victory to my daughter, Melissa. Melissa, this one’s for you. In your life, you always cared and did good things for others. May your death also bring some good to others through this new law,” Gosule wrote in an e-mail to reporters. Governor Deval Patrick wanted judges to have more leeway in sentencing but couldn’t withstand overwhelming election-year political pressure. While law enforcement groups had also lauded the bill’s passage, given the circumstances of Maguire’s murder, the late officer’s brother criticized Patrick for not inviting him and other supporters of the bill to the signing ceremony. “I was really caught off guard by it, if you want to know the truth,’’ Charles Maguire told the Globe during a telephone interview. Charles Maguire, a former probation officer, said he went to the dry cleaners today so he could have the proper clothes for a State House signing ceremony he expected to be held on Friday. Jack Maguire was killed on Dec. 26, 2010, in a shootout with suspected jewelry store robber Domenic Cinelli, who had been serving three concurrent sentences of 15 years to life before being paroled. The shooting not only sparked an overhaul of the state Parole Board, but also sentences for repeat offenders. Under the new law, if a criminal amasses three convictions from a list of 46 violent crimes, he or she will be denied the possibility of parole. The nature of today’s signing ceremony, however, underscored Patrick’s frustration with publicity surrounding its enactment. It also highlighted some of the blowback he has received for saying he would sign it after hinting earlier this week he might veto it if lawmakers did not approve an amendment he sought so that judges gained some leeway over sentences for some habitual offenders. Despite widespread public attention on the bill, and plans to hold a public signing ceremony in Ashland at 11:30 a.m. for a bill “further regulating animal control,” Patrick signed what has become known as “Melissa’s Law” before Gosule and just one other advocate - Barbara Dougan at Families Against Mandatory Minimums - at 9:45 a.m. in his State House office. The first word leaked from Gosule himself, while Patrick’s office did not follow its usual practice of issuing a statement about or photo of the signing. Yet the governor’s press secretary, Kim Haberlin, e-mailed reporters to highlight another aspect of the legislation, which took effect immediately. It created parole eligibility for 580 non-violent drug offenders. Their release will help reduce what the governor has branded the “warehousing” of criminals, while also saving the state $2.5 million annually. By contrast, his staff said the repeat offender aspects of the law will affect fewer than eight people a year, and not have any substantive effect on people in the correction system for 25 years. Gubernatorial aides also argued that Patrick himself had helped boost the law by negotiating with legislators and using his bully pulpit to gain its final passage in the House and Senate. The bill was opposed by many of the governor’s closest allies, including liberals and African-­American activists and lawmakers. They had believed that ­Patrick, the state’s first black governor, a former member of the NAACP Legal Defense Fund, and once the top civil rights official at the US Justice Department, would veto legislation that they argued would exacerbate an incarceration crisis among black men and lead to untold prison costs. Charles Maguire said the absence of a public signing ceremony on Beacon Hill was a disappointment. John R. Ellement of the Globe staff contributed to this report. Glen Johnson can be reached at johnson@globe.com. Follow him on Twitter @globeglen.